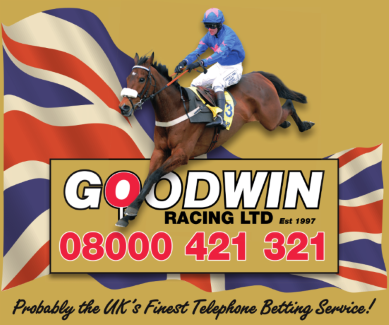 Choicebet(UK) Ltd is the holding company for Goodwin Racing who were established twenty one years ago in East Sussex. From starting off life as a retail business we have now evolved into one of the UK’s fastest growing telephone betting companies. In addition you will regularly see us laying bets at racecourses throughout the south east. Our team of operators have all been handpicked so that they can give the best possible experience to our customers. A keen interest in sport is a must so that we can find whatever event or market you’re interested in with the minimum of fuss. We are pleased to offer a magnitude of betting opportunities including in play. Our money back offers are legendary. Unlike most companies who may offer a carrot to get a new customer our offers are permanent. As well as offering the usual best odds guaranteed and double result pay out we have an array of permanent offers including up to £500 back as a free bet if your selection is beaten by a short head or nose. We do have customers who can bet in four figures but also we have many small staking customers. As the big organisations turn their attention to their online sites they now seem to have created a barrier where customers can’t have a telephone bet unless they stake £25. The good news is we are more than happy to open accounts up for customers who want to only place £10 a call. Another area of our business that we are particularly proud of is paying our customers swiftly. In our experience the majority of companies can take up to 5 working days for people to get their money however following a withdrawal request we guarantee cleared funds in our customer’s accounts by noon the following day. Placing a bet couldn’t be simpler; we accept transactions via all UK debit cards. After registering the card it is stored securely where all but the last four digits of your card are encrypted. All we will ever need in the future when you want to top up the account is the 3 digit CVV number. On opening an account you will be allotted a unique customer number. When opening you will be asked if you’d like to put a deposit limit on your account. There will be further options available if ever you feel you are spending too much money such as time out or self exclusion.